ProteinPLUS® Thin Spaghetti is a delicious multigrain pasta made with simple ingredients like flaxseed, barley, and oats, plus protein-rich chickpeas, lentils, and egg whites, and is a good source of lean protein. Thin Spaghetti provides a thinner version of the world-beloved traditional Spaghetti recipe. This slight change in thickness highlights its delicate, nutty flavor. 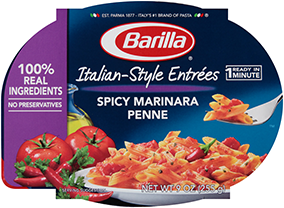 Barilla ProteinPLUS® Thin Spaghetti, also known as "Spaghettini", pairs well with tomato-based or oil-based sauces. Get creative with your ingredients, as this pasta pairs well with a variety of fresh vegetables and cheeses. Cook Barilla ProteinPLUS® Thin Spaghetti in boiling water for 8 minutes, then drain and serve according to the recipe directions. For more tender pasta, boil an additional minute. Due to its higher protein content ProteinPLUS® takes several extra minutes to cook than traditional pasta.